Specificity/Sensitivity: Recognizes a protein of 70kDa, which is identified as CD86. 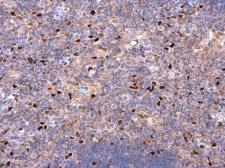 CD86 is a type I transmembrane glycoprotein and a member of the immunoglobulin superfamily of cell surface receptors. It is expressed at high levels on resting peripheral monocytes and dendritic cells and at very low density on resting B and T lymphocytes. 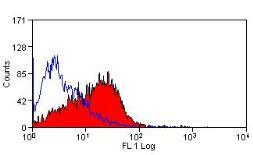 CD86 expression is rapidly upregulated by B cell specific stimuli with peak expression at 18 to 42 hours after stimulation. CD86, along with CD80/B71, is an important accessory molecule in T cell co-stimulation via its interaction with CD28 and CD152/CTLA4. Since CD86 has rapid kinetics of induction, it is believed to be the major CD28 ligand expressed early in the immune response. 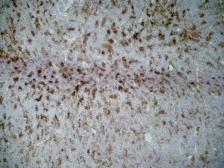 It is also found on malignant Hodgkin and Reed Sternberg (HRS) cells in Hodgkin's disease. Specificity/Sensitivity: Recognizes a protein of 70kDa, which is identified as CD86 (HLDA V; WS Code BP BP072. HLDA V; WS Code A A109. HLDA VI; WS Code BP 95. HLDA VI; WS Code B CD86.9). CD86 is a type I transmembrane glycoprotein and a member of the immunoglobulin superfamily of cell surface receptors. It is expressed at high levels on resting peripheral monocytes and dendritic cells and at very low density on resting B and T lymphocytes. CD86 expression is rapidly upregulated by B cell specific stimuli with peak expression at 18 to 42 hours after stimulation. CD86, along with CD80/B71, is an important accessory molecule in T cell co-stimulation via its interaction with CD28 and CD152/CTLA4. Since CD86 has rapid kinetics of induction, it is believed to be the major CD28 ligand expressed early in the immune response. It is also found on malignant Hodgkin and Reed Sternberg (HRS) cells in Hodgkin's disease. 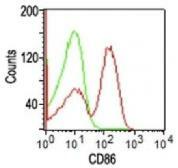 Specificity/Sensitivity: This antibody recognizes rat CD86, otherwise known as B7-2.